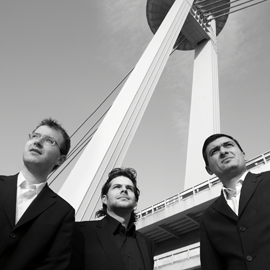 THE HUGO KAUDER TRIO  three Slovak musicians  soloists, chamber musicians and members of leading European orchestras. The Hugo Kauder Trio was founded in 2008 by Ivan Danko, solo oboist of the State Opera in Stuttgart and winner of the International Hugo Kauder Competition in New Haven in 2009. His idea to establish an ensemble with this unique combination of instruments originated while performing with the violist Róbert Lakatos and the pianist Ladislav Fanzowitz. The combination of oboe, viola and piano creates an interesting sound alternative to the typical piano trio and opens up an exceptional and innovative repertoire. In their search for suitable repertoire, the members of the trio discovered the musical legacy of the composer Hugo Kauder (1888  1972). Kauder was born in Tova?ov (Czech Republic) and belonged to the generation of persecuted and expelled Jewish artists of the 20th century. His origin, and the fact that these practically unknown -above all late-Romantic- compositions contain elements of Central European folk music, inspired the ensemble to adopt the name the Hugo Kauder Trio. In an attempt to unveil lesser known works, the Hugo Kauder Trio is exploring other works by persecuted composers and unknown authors of the 19th and 20th centuries.